We advocate rejecting the politics of fear, revisit the flawed FISA Amendments law and Patriot Act, and safeguarding the people’s rights under the Fourth Amendment to the U.S. Constitution. Alas, it wasn’t enough. Obama declined to support the filibuster by Senators Feingold and Dodd. On July 9 2008 Congress passed the FISA Amendments Act – giving the government virtually unrestricted access to collect Americans’ international communications, and granting retroactive immunity to telecoms that had cooperated in illegal Bush-era spying. We kept organizing after the vote, running crowdfunded pro-civil liberties TV ads during the Republican National Convention that August and in DC in January 2009 for Obama’s inauguration. In early 2009 we allied with DREAM Activists and undocumented youth, the Stonewall 2.0 LGBTQ movement, and peace activists in the Ideas for Change competition. 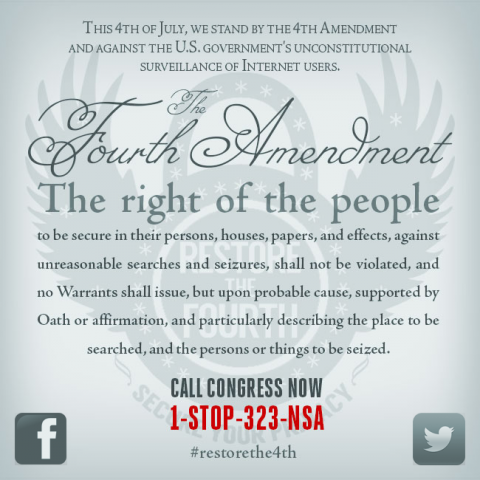 Since then, as newer groups like Restore the Fourth and Fight for the Future have taken the lead, we’ve come back to life from time to time – most recently, to let people know about Get FISA Right alum Shahid Buttar’s Congressional campaign. Our tenth anniversary’s a good opportunity to check in, reflect on the past and what we can learn, and talk about what next. So whether or not you were part of it back in the day, we’d love to hear your memories of Get FISA Right – and thoughts about the future of civil liberties activism. As we predicted in 2008 (and even after the Snowden revelations highlighted the intelligence agencies’ abuse of their power), Congress has repeatedly expanded the scope of warrantless wiretapping – and failed to introduce any meaningful safeguards. With the Trump Administration becoming increasingly authoritarian, and Democratic leadership complicit, risks that seemed abstract or hypothetical to many people a decade ago are overwhelmingly real. As soon as he got elected, Obama’s “Digital” team shut down my.barackobama.com’s organizing abilities – a huge lost opportunity. In the decade since then, nothing’s emerged to replace it. Twitter has helped the alt-right weaponize their tactics to the point where Amnesty International describes it as “toxic place for women”. And so on. It’s almost like people with power are scared of what might happen when people organize online and are doing their best to stop it. Groups like Black Lives Matter, the Water Protectors, and StopLAPDSpying – along with intersectionally-focused leadership in civil liberties coalitions and academia – are increasingly highlighting the relationship of government surveillance to the prison-industrial complex, immigration, racism, and environmental justice. As Get FISA Right heads into its second decade, there’s still a big potential role for grassroots social network activism in the fight for civil liberties – and for justice. There’s a lot to learn from our experiences. What worked? What didn’t? How would we adapt things to today’s, and tomorrow’s environment? So please share your perspectives – in the comments here, on the Get FISA Right wiki, on social networks like Twitter, Facebook, Medium, Mastodon, and Diaspora, or wherever else works. We’ll collect the responses and follow up with a post in a week or two. In the meantime, help us get the word out by sharing, liking, tweeting, emailing, and otherwise letting people know. Thanks to everybody who’s been involved with and supported Get FISA Right and the fight for civil liberties over the last decade. Looking forward to the next ten years! * The hundreds of the replies to Obama in the MyBO conversation are gone, but here’s the copy of Obama’s response the campaign cross-posted to the Huffington Post. The Get FISA Right wiki has more of the context, including A brief history, Coverage, and This time, *we’re* writing the history. This entry was posted on Wednesday, July 4th, 2018 at 12:45 pm and is filed under Uncategorized. You can follow any responses to this entry through the RSS 2.0 feed. You can leave a response, or trackback from your own site. Primary justifications for Patriot Act and FISA arise from the false narratives about the 9-11 false flags attacks. You heard me say this in 2008 and ignored exposing the 9-11 lies. Thanks for this—10 years! So much is different, yet so much could have been predicted. Julian Assange has been in sanctuary for much of that time, since June 2012; now immigrants, particularly those who are unauthorized, but also legal residents, are fearing deportation from the U.S.A. I often bring up Candidate Obama’s vote on warrantless wiretapping when folks get too antiRepublican—this group started as “proud Democrats,” but by the PATRIOT Act reauthorization vote, one of the last big issues we worked together, most of us had disavowed that connection, even if we sometimes still pulled that lever (or perhaps pushed that button). Reminder: the parties are 2 wings of the same bird; answerable to their corporate donors before anyone else, or so it seems. Those campaign dollars are too valuable! We were innovative; much as Barack Obama’s campaign made new use of social media, so did we—and getting a response from the candidate, and later having one of our questions make it to the top 10 on the much-lamented (though not necessarily effective) White House petition site, shows that we did something, maybe many things, right. When we left myBo, we did so because we were blowing up the site with the sheer volume of our outraged discussion—there were at peak 23,000 of us, gradually shrinking to a core group of <25. We first went to WetPaint, ultimately landed here on WordPress. It was an exciting time; I had not been active in politics really ever, had in preInternet days been a member of various environmental groups, but basically that meant sending in dues and reading newsletters, maybe signing petitions. The 2008 primary was my first ever (though I had, and have, religiously voted in every possible general election). Had that vote come in May, instead of July, who knows what the world would look like today? I certainly would not have been as enthusiastic about the candidate if he had not already won the primary when the FISA vote happened, though I am just one person. Since 2008? Delay in leaving the party meant that the County offered me a job as poll worker; something that I thought was cool even as a kid. In 2011, I was a “sporadic” visitor to Occupy Wall Street, dropping off small supplies from time to time, then attending the National Gathering in July 2012 in Philadelphia. A memorable 4th, almost in the shadow of Independence Hall, envisioning a better world. Then I voted for the Justice Party’s Rocky Anderson for President in Nov. 2012, just after Superstorm Sandy and Occupy’s response, Occupy Sandy and Occupy Sandy NJ. I helped organize the Occupy “NatGat”s, in 2013 in Kalamazoo and in 2014 in Sacramento. That network, including InterOccupy and Democracy Watch News, continues on. As time moved on, the group expanded in different directions, but there were real connections—when we lost Mark, it was the loss of a family member, I think we all felt. We talked about Fukushima, we talked about Anthony Weiner, we raised funds for Russ Feingold. If the Obama campaign had reached out to its supporters after winning the White House in the Nov. 2008 election, instead of shutting us out, who knows what we might have done? Maybe that is why they closed the door; they were really too interested in becoming the new establishment, not really as much about Hope and especially Change as they led us to believe. Older and wiser, I still wear a button that says “Action is the antidote to despair”—so let’s keep on keeping on!